The T-2004XL Aluminum Tripod with E-20 Ball Head from Sirui features reverse-folding legs that go around the ball head allowing it to fold down to 18.5". The T-2004XL extends to a height of 67.9" and weighs 4.5 lb. The center column on the T-2004XL is reversible for low-angle shots, and a short center column is included to get the tripod down to 9.6" above the ground. The 4-section legs have twist locks and are individually adjustable. The E-20 ball head compliments the tripod and fits snugly between the 180° legs. It has separate locks for the 360° panning and ball movement. A lock on the clamp prevents the Arca-type compatible clamp from being accidentally released, and a numbered scale enables exacting pans. A padded case and shoulder strap is included to keep the tripod and head protected during transport. Box Dimensions (LxWxH) 21.5 x 5.9 x 5.4"
T-2004XL Aluminum Tripod with E-20 Ball Head is rated 4.7 out of 5 by 13. Rated 4 out of 5 by Aaron K from Mostly good, but B&H listing was inaccurate Actual weight is 4.3 lbs (heavier than advertised at the time of my purchase) Maximum height is 67 inches (taller than advertised) Twist-lock legs are less convenient than flip-locks. Pan feature is very smooth. Good looking tripod that feels sturdy despite being lightweight. The specifications on B&H's listing were wrong at the time of my purchase; I recommend looking at manufacturer's site for correct specs before purchasing here. Not sure if it would hold the advertised 33 lbs on the ball head, but holds my 9 lbs camera fine. Rated 5 out of 5 by Eye Driven Photography from Solid tripod, yet compact enough to carry and travel This tripod was recommended to me by a sales tech at the B and H store. I was first going for a monopod and I had 3 major goals for this buy along with a reasonnable price tag: lightweight, reach high in length (most lightweight tripod do not deploy very high) and study structure for my heavy equipment. The recommendations I received from B&H Tech guy made me realized a monopod would not really worked for me, flimzy and not study enough for heavy equipment and shoot landscape or night photography; the Tech person helped me do the right buy and was really onb point. This is a very strong tripod, well built and comes with a carry-on case, also well built, not like those cheap bags. it is very study and can load a lot of equipement on it, also compatible with my peak design carry on plate (arca type) so it complies with my needs. I carry a Nikon D750 with big/heavy telephoto and wide angle lenses, and this tripod does the job like a pro. Horizontal and vertival shots with the ball head work like a charm with no shaking or slow sliding : very precise and consistant. price is ok (around $) compared to similar or lower quality for other brands with a price tag more close to $. Overall, an excellent buy for a brand I did not really know until it was presented to me by the tech person at the store and I am glad he did. Rated 5 out of 5 by Photo on the fly from Light Weight and fits nicely in luggage for Travel!!! Love this tripod I have just made my first trip with it to Wisconsin and it easily fit in my luggage and used it a couple of times today. My d750 with a 80 to 200 nikon f2.98 lens sits on it perfectly with no need for extra weight to stead the tripod. I like the ball head that came with it but may look for a secondary pan head as well. Rated 4 out of 5 by Arnold L. from Use with a long range Canon lens I found the tripod with head gave sufficient stability to shoot at extreme range with no movement. Rated 5 out of 5 by michael m. from Very Nice Tripod! I am using the tripod for astrophotography and birding and so far it has exceeded my expectations. It does take a little time to set up but if you are using a tripod you usually have time anyways to I don't really see it as an issue. The tripod usually takes about 30 seconds to get all situated with my camera on top. I have used it to hold my D7100 with a short lens for stars, and also with my D500 with a 150-600 telephoto with great results. The panning and ball movement is excellent as well, nice and smooth. Rated 5 out of 5 by Deanchen from WOW what a Tripod! Nice Product with a very high Quality Standard! Compact and very strong. Rated 5 out of 5 by EzEd from Great Buy for on a well-made tripod Very well made, with standard features that are optional on more expensive ones.? The largest and smallest legs are the same diameter as those on my Gitzo 1228.? Spiked feet are standard, as is a short column (replaces attached column) which allows the legs to be splayed out parallel to the ground for very low shots.? With the short column, a 5' 6" person can stand upright, eye-level with the camera.? Ball head is smooth and sufficiently strong for 3-4 pounds of gear. 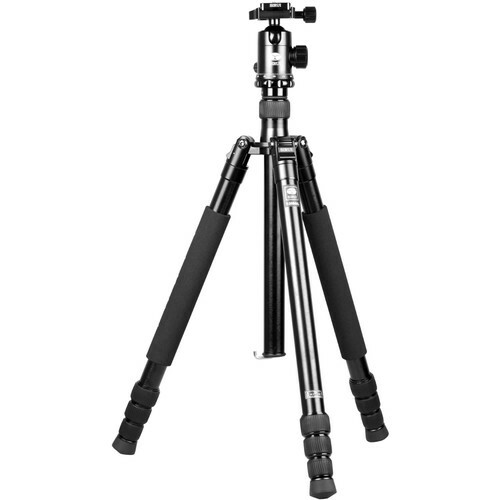 The B&amp;H site says no retractable spiked feet but the Sirui site shows this tri-pod to have retractable spike feet? Do this tripod come with retractable spiked feet? Yes,this particular model (T2004XL) does have retractable spiked feet. The feature is not listed on the packaging label on the outside of the box, but this product does in fact have retractable feet. All you have to do is turn the rubber knobs at the base of the tripod. Not seeing the inclusion of a QR plate anywhere. Is one included with this combo? Asked by: L. Edward S.
The Sirui E-20 Ball Head includes the TY-50E Plate. Will the legs on the Sirui T-2004XL splay out 90 degrees from the center axis for low-to-the-ground shots? Yes, use the included Allen Wrenches to loosen the screw at top of of the leg. This frees the Clamp located there and the leg can be set at any degree (90). Then tighten the screw until the leg(s) is are secure. This screw/clamp is used to allow legs to bend up for carrying. The center column can be set where ever you like. What is the max height including ball head, without extending centerterpost?